Digital customers are more likely to buy if they interact directly with the Brand. Interact, dialogue and communicate proactively with your customers! Engagent is the innovative Customer Interaction solution that allows you to interact in real time with your clients thanks to its Artificial Intelligence (AI) and BOT systems, proactively providing the responses, information and assistance they require, and anticipating interest based on browsing behaviour on your website or mobile app. Engagent improves service experience for your customers and users thanks to machine learning technologies, which understand requests and offer the most appropriate responses in natural language. Engagent offers users rapid, comprehensive assistance and proactive dialogue though real-time self service. Provide a simple, round-the-clock service for your users that is also economical for your company. PAT, with its Engagent solution, has been cited in the Report di Gartner “Market Guide for Virtual Customer Assistants” as one of the 28 vendors in the worldwide benchmark for the industry Customer Virtual Assistants. Providing an ongoing and proactive support in offering our products and services within our e-commerce platform met our most important strategic business need. Human & Virtual Interaction provide your customers with immediate responses and all the information and assistance they need. Share informational material, links, presentations and videos with customers you are in contact with. Customise your users’ automatic engagement processes based on their browsing behaviour and your business objectives. Attract, engage and interact with your users, guaranteeing them a quality digital experience. Offer your customers the opportunity to be re-contacted regarding complex requests and needs, or when they want to speak with an operator. Tab, Banner, Lightbox or Chat: apply the right widget for each rule of engagement you configure. 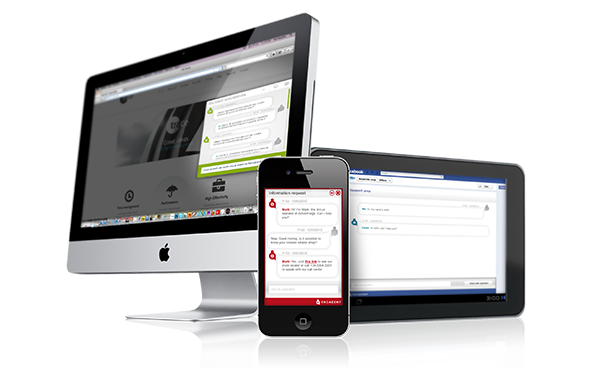 Engagent is integrated with your company’s IT systems through Webservices, and with your website and mobile applications through the Chatbox interface. Available in both versions to meet your business needs.